“What do you think is the biggest problem facing America today?” I asked a recent college graduate. “I don’t know and I don’t care.” Was the cocky millenial’s response. 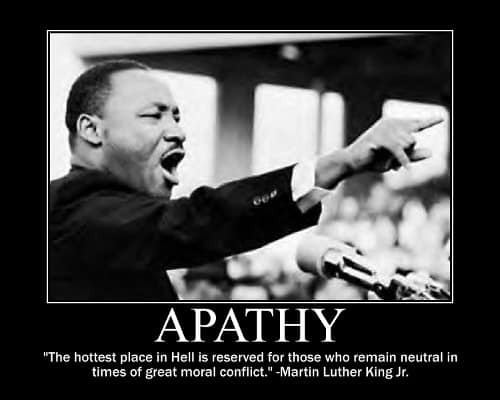 Is there as anything in the world as powerful as apathy? I awakened today to a thick, sulfur stained cloud…the second hand smoke of our neighborhood Independence Day celebration. I love my country as much as anyone you can possibly run into, but the who-gives-a-damn attitude about the moral condition of this nation exhibited by those lighting the firecracker fuses is almost more than I can take. The average person under 40 that you run into in this nation can tell you more about the Kardashians than they can about the Founding Fathers. Most of those who cavalierly shoot off bottle rockets, while they swallow bottles of Budweiser, have no idea what “Independence” cost those who came before them. To the average Joe, liberty means nothing more than one’s “right” to not give a crap. Yep, apathy is a powerful thing. Why is it that we Americans care so little about what matters the most? Our nation is adrift in sin. I know that is not a very popular word to use today…sin…but the after affects of “liberty” is an unrestrained evil masquerading as freedom. My life…my body…my choice…goes the refrain from America’s self-lovers. “Who are you to judge?” echo the catcalls of those who have interpreted free will as the right to do whatever…to whomever…whenever. If I hear one more round of “God Bless the USA” I think I will barf. “Why”? I asked those around me as the bombs were bursting in air. “Why SHOULD God bless America? As the sparkler in my hand grows shorter and shorter I become urgently more aware of how little time I have to make an impact. The land I leave behind is the land my grandchildren will have to I live in. Where are the good men? Don’t they care about their children’s future? Where are the pastors who are more concerned with pleasing God than pleasing man? Where are the politicians who will stand up and fight against the forces of darkness? Where are the men who will father their children and defend their Lord? Where are the men who will fight for what they believe in? Where are the men willing to die for a cause greater than them? Where are the men who will stand in the gap and repair the broken paths? The enemies of the cross are not complacent. Those who spit in the face of God are committed to their demonic evangelism. “The righteous are as bold as lions” the Scriptures declare. But it is the wicked who are bold. It is the wicked who live out their world view. It is the wicked that aggressively promote Satan’s agenda. What would America look like if Christians worked as hard to serve Jesus? It is not that THE CHURCH cannot make a difference in the world around us…it is that we don’t care enough to try. The world is on fire and the Christian culture is disintegrating. Apathy hardens the heart. Apathy destroys one’s passion. Apathy passes the buck. Apathy looks the other way. Where are we going? What does the future hold? Could you make a difference if you simply opened your mouth? What if God was counting on you? Apathy is a powerful force that requires nothing of you. Perhaps the rock stars were correct. Maybe that is why there is a stairway to heaven…but a highway to hell. Most Americans are barreling down that highway with the throttle wide open. Apathy is a powerful force.